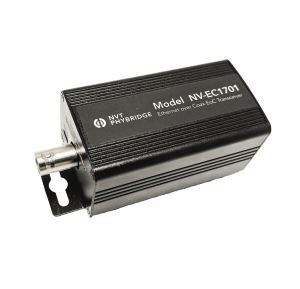 These transceivers are extremely simple to use, with no IP or MAC addressing required. Status LEDs indicate power and link connectivity/activity for RJ45 and BNC ports. They are backed by NVT’s award winning customer support and limited lifetime warranty. *Distance and number of devices supported may lower due to power supply capacity and wire voltage-drop. **Also available with 55VAC, 110 Watt power Supplies, contact NVT for details. *Also available with 55VAC, 110 Watt power Supplies, contact NVT for details.